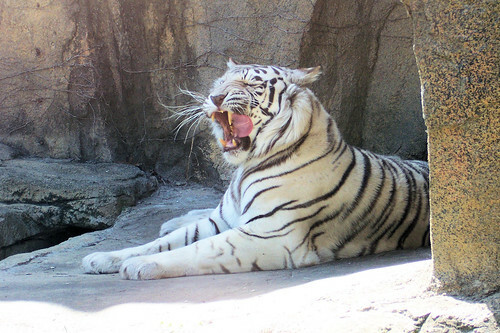 On a visit to Potawatomi Zoo in South Bend a few years ago, my Kodak EasyShare Z730 in my hands, I shot this series of this white tiger yawning. I like the middle shot the best, as it looks like the tiger is licking his chops, thinking about something he’d like to eat. Could it be you? 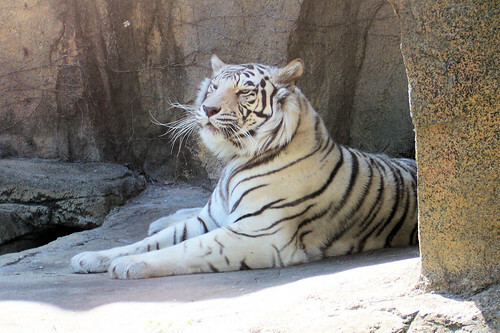 I love to go to the zoo and Potawatomi Zoo is my favorite. Sure, bigger zoos in bigger cities have stunningly elaborate habitats with animals you can’t find in smaller zoos like Potawatomi. But Potawatomi has plenty of great animals and you can see it all in a couple of hours. I’m also really partial to Potawatomi’s little petting zoo. It’s mostly young goats but it’s still a lot of fun. It’s the second place I visit – after the tigers. Most excellent shots! 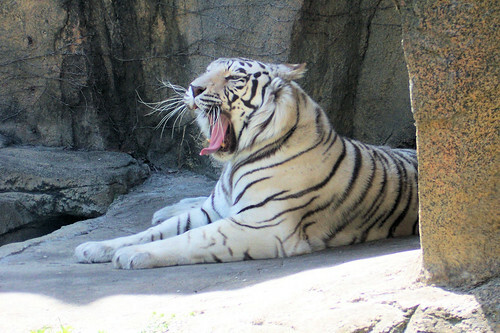 I’m drawn to the tigers, too; and it has been much too long since I’ve been to the zoo. Hmmm. Well, it is getting colder, so don’t delay! Your work ethic is an inspiration to us all, though in fact that video is SFW. Yeah, but our office is essentially open plan. There’s only a limited amount of personal Internetting I’m willing to do when everybody can see!